Brand New Bush Hog Model PVS-602, 60" Cat 1 & Quick Hitch, 3pt Double Roller Pulverizer with "Spike" Type Shanks. * Made for Tractors with up to 60 PTO HP. * Weighs 640lbs and comes complete and ready to use! 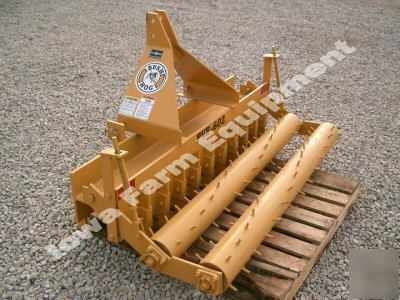 * This is a Very Well Made, Heavy Duty Pulverizer with a solid A-Frame. * Used for Pulverizing, Scarifying & Grading. * Ideal for single pass seedbed preparation! * Independent spring suspension allows the Rollers to follow any contour. * Pulverizer has 1" Roller Bearings, and a Hinged Rear Roller. * You are purchasing a "Spike" Type Shank Pulverizer. Photo shows a "Bar" Type Shank Pulverizer. Plus, we are glad to say, all Bush Hog products are Made in the USA!!! * For more info, e-mail or call us at .